'Once upon a time, a very long time ago now, about last Friday, Winnie-the-Pooh lived in a forest all by himself under the name of Sanders. 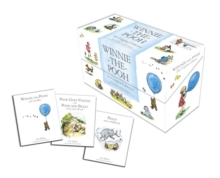 'Why settle for one Winnie-the-Pooh story, when you could have the complete collection of A.A.
Milne's 30 stories?Quite simply the most wonderful gift books to give a child, this elegant slipcase contains every heart-warming moment of this classic character series. Since Pooh's first appearance in publication in 1924 the "bear of very little brain" and his friends Piglet, Eeyore and Tigger have charmed millions of children - not to mention their parents - across the world. And his continuing success proves the timeless nature of A.A.
Milne's stories, based upon the nursery toys played with by his own son, Christopher Robin. Thanks to the use of E.H. Shepard's charming original illustrations on this high quality slipcase, this gift set is sure to gain pride of place on the bookshelf of any family lucky enough to receive it. Pooh ranks alongside other beloved character such as Paddington Bear, and Peter Rabbit as an essential part of our literary heritage. Whether you're 5 or 55, Pooh is the bear for all ages. A.A. Milne is quite simply one of the most famous children's authors of all time. He created Winnie-the-Pooh and his friends Piglet, Eeyore, Tigger, Kanga and Roo based on the real nursery toys played with by his son, Christopher Robin. And those characters not only became the stars of his classic children's books, Winnie-the-Pooh and The House at Pooh Corner, and his poetry for children, they have also been adapted for film, TV and the stage. Through his writings for Punch magazine, A.A. Milne met E.H. Shepard. Shepard went on to draw the original illustrations to accompany Milne's classics, earning him the name "the man who drew Pooh".